While no single theory of integration is able to explain the functioning of the European Union, member state remains the most powerful element of the EU decision-making system. 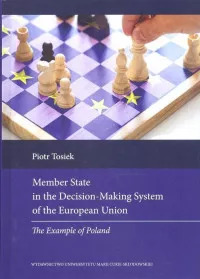 Three approaches of different rank (liberal intergovermentalism, deliberative supranationalism, fusion thesis) are used in this book to analyse both the role of an abstract state in the EU as well as the role played by Poland as a specific example. In the latter case, four dimensions of state’s experience are elaborated: its power in terms of political position and economic situation; the vision of European integration and the vision of state’s role in the integration system; the legal background of European policy; the administrative aspects relating to experience of national officials working for EU institutions. The book as addressed not only to experts, academics, students, officials and journalists, but also to all those who interested in theory and practice of European integration.